This image of Comet C/2014 Q2 Lovejoy was taken on Dec. 17, 2014 by the Slooh Community Observatory's telescope in Chile. A comet that has been putting on a show for skywatchers over the past month is making its closest approach to the sun this week, and you can follow the celestial object's progress live online today (Jan. 29). Comet Lovejoy, formally known as C/2014 Q2, has been dazzling stargazers watching through binoculars and telescopes with its green glow since mid-December. The comet made its closest pass to Earth on Jan. 7 and will achieve perihelion — the comet's closest approach to the sun — on Jan. 30. To mark the occasion, the Slooh Community Observatory is hosting a live webcast today, beginning at 5:30 p.m. EST (2030 GMT). You can watch the comet webcast directly from Slooh at the observatory's website: www.slooh.com. "Slooh's members have been watching [Comet Lovejoy] right from the early days after its discovery, capturing images of its evolution and development from a distant fuzzball to the beautiful comet we're seeing today," Slooh astronomer Will Gater said in a statement. "Now, as it reaches perihelion, we'll be looking back at the comet's incredible journey so far and finding out what Slooh's powerful telescopes are seeing right now." Comet C/2014 Q2 will be about 120 million miles (193 million kilometers) from the sun during its perihelion pass on Friday. The icy object came within 43.6 million miles (70.2 million km) of Earth on its Jan. 7 close approach to the planet. Comet Lovejoy's green hue, which was a pronounced shade in December and earlier this month but is now less apparent, probably results from the presence of two gases, researchers say — cyanogen [(CN)2] and diatomic carbon (C2). This is your last chance to see Comet Lovejoy, which is a long-period comet. It probably won't be back in Earth's neck of the cosmic woods for another 8,000 years, scientists say. 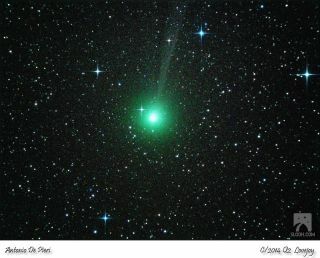 Editor's note: If you capture an amazing photo of Comet Lovejoy with binoculars or a telescope and want to share it with Space.com, you can send the image and comments to managing editor Tariq Malik at: spacephotos@space.com.